Enter a medieval realm as you take the role of a feudal King embroiled in a war to gain control over the surrounding lands. As a King, you musty send your retinues of brave knights onto the field of battle, who then fight with strength of arms and courage, to drive off your foes and conquer the territories of the region. But that's not all! You must also manage your resources wisely in order to aid your kingdom in times of need, though be wary of your adversaries as all are intent to claim Medieval Mastery! 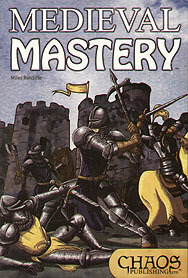 Medieval Mastery is a fun, tactical board game that incorporates Area Control, Hand Management and Modular Board Design as well as Variable Player Powers and Phase Order. The rules include alternate game play variations. This, coupled with a modular game bard and a random distribution of crowns, orbs and sceptres, means that no two games will ever be the same. In addition, the number of components included allows for up to three games of varying sizes to be played simultaneously. In this game you are aiming for thirteen influence points, scored from conquering territories by advancing your knights. Moving into different territories has different effects. The terrain can be varied, making play even more challenging. An ever-changing game in that just when you think you are on the brink of winning, everything can alter. A nice game, an interesting use of dice, but sometimes there just aren't enough dice, causing a re-think of deployment. Launched at the UK Expo2011 this is an independently published game by Chaos Publishing. Components: It comes with a set of coloured dice and a set of cards for each of the 6 players, a deck of artifacts and a set of Hex tiles (Territories, Castles and Lakes). All of the components are of good quality, the cards are well made and would not look out of place in a game by any of the larger manufacturers. The artwork is very much in keeping with the theme and well drawn. Setup Although tiles are placed at random, there is a defined layout according to the number of players. Castles and lakes are in set positions plus the territories, which have values 1-3, are laid out in a certain pattern according to value. Each player has their own deck of identical cards which are shuffled at the start of the game and players deal themselves a hand of 5 cards. Players also start with 3 random artifacts, 1 x Sceptre, 1 x Crown and 1 x Orb, all of which provide special powers which can be used during play. Finally on each players Castle they place a D6 with the 6 showing face up to show the number of Knights that start there, if they have a homeland(s) near their Castle their Knights needs to be evenly spread between the Castle and Homelands. Gameplay On a players turn they add 3 additional Knights to their Castle then they can make one advance, Knights can move out from the Castle through areas controlled by you own Knights into either empty areas or into an area controlled by another Player. If the area is empty those Knights take control and earn the player points (1-3), the first player to 13 points wins. Various tiles have special effects or conditions that need to be taken into consideration, but in general each hex can only have upto 6 Knights of that player. Battles are handled by cards each player choosing a Conflict Card (Valued 1-5), if they have one otherwise they are assumed to be playing a 0 value card, playing it face down. The conflict card value is added to the number of knights they have, support cards can also be played at this point which add to the total, the highest wins and the loser loses the difference in numbers from their Knights, the remainder fleeing back to their Castle. On a draw the attacking player loses 1 Knight, players can also use their Artifacts if appropriate, there are also cards that shatter these making them unavailable until the end of that players next turn. As cards are used you do not draw any replacements, the only time you make your hand back up to 5 is when you enter Combat, thereby encouraging players to encroach on occupied areas both to decrease players points but to gain those much needed cards. This is a brief overview, there is much more details to the tiles and cards. Conclusions I really enjoyed this game, well I did buy a copy, there is a lot here with plenty of variation to keep you coming back for more. There is also enough components to have up to 3 games of varying sizes running simultaneously from the same set! This will get a lot of play and I commend the makers of this on the attention to detail, well written rules and superb gameplay which, with my limited plays to date, seems well balanced. I look forward to more games from them if they end up the same standard or better than this one.